THE HISTORIC GAME OF "CALCIO IN COSTUME"
The game of Calcio in Costume bears no resemblance to football, although calcio is Italian for football, or soccer. It was probably invented in the military encampments where the soldiers resting between battles would have lost strength without exercise. Here was a game which developed arm and leg muscles in a real hand to hand struggle for what was the size and shape of a cannon ball. It was first played in Florence not so much as a sport as for training young men in the art of combat. The most famous match was probably that played on 17 February 1530, in Piazza Santa Croce. The Florentines had taken advantage of the sack of Rome by the imperial armies in 1527 to drive the Medici out of the city for a second time and place themselves under the sovereignty of Christ and the Virgin, determined to defend Florence to the last against the imperial armies spurred on by Pope Clement VII. The imperial army, the most powerful of the time, laid siege to Florence from the summer 1529 to that of the following year. It was a memorable siege , which became steadily more severe, the city began to feel the shortage of food, although the general feeling in the city at that time was summed up by the graffiti on the walls; poor but free. It is in this atmosphere that a game of Calcio in Costume was played in mid-February, not just to keep up the ancient tradition of playing during carnival but more to show the city's scorn for the besieging troops, who considered Florence exhausted and already defeated.To emphasize this scorn a group of Florentine musicians played from the roof of Santa Croce so that the enemy would have a better idea of what was going on. Suddenly a cannon ball from the imperial batteries flew over the heads of the musicians and landed on the other side of the church; no damage was done, and it was greeted by the jeers of the crowds and the clamour of the instruments. There are no records of who won the match, maybe because it seemed more of a joint effort against the enemy than a tournament amongst teams. Although the match was a success, the city soon capitulated and the iron rule of the Medici returned. The matches were played almost without interruption until the end of the 18th century, and only in May 1930 on the fourth centenary of the siege of Florence was the historical manifestation started up again. Nowadays three matches are played, by teams drawn from Florence's four major neighborhoods, in Piazza Santa Croce, on 16th, 24th, 30th of June on the recurrence of the patron -saint. After the long parade headed by the nobles on horseback, starting in Santa Maria Novella and culminating in Piazza Santa Croce, the game begins to cries of Viva Firenze! It is an hour of continuous struggle, attacks, scuffles, blows and tangling of bodies dressed in fifteenth-century costumes. It is intended to echo the famous match of 1530, in the desire to revive and to record a memorable page of the city's glorious history. 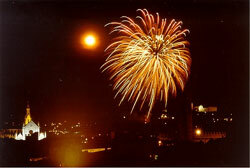 Every year on Easter Sunday Florence hosts the Scoppio del Carro, the explosion of the carriage. This harks back to when the Holy Fire was sparked off by using stone chippings from the Holy Sepulchre, and it was customary to then use it to rekindle the flame of all the hearths in the town. 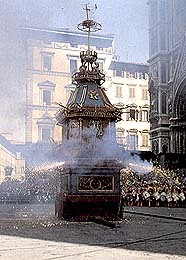 Subsequently the Ceremony has become symbolical, and now on Easter Sunday a great Chariot, which goes back to the eighteenth century, is drawn by white oxen festooned with garlands, and is paraded along the streets to the Cathedral Square from Porta a Prato, where it is kept for the other 364 days of the year. A steel wire connects it to the High Altar in the Cathedral. During Midday Mass when the time comes for the Gloria in Excelsis the Cardinal Archbishop lights a rocket in the form of a dove with the holy fire obtained by means of the ancient chippings. The rocket shoots down the wire to the Chariot stuffed full with firecrackers, which thus explodes to the great joy of the onlookers. La tua l'é coi pidocchi! Florentine children sing this song as they wander through the streets of Florence the first week of September, carrying papier-mâché lanterns tied to the ends of sticks, called rificolone. There are several theories as to where the tradition originates from, some think it commemorates the triumphant entry of Florentine troops into Siena on August 2 1555, when the soldiers tied lanterns onto the ends of their pikes. More probably the Festa della Rificolona grew out of the great autumn market held on September 7, the day before the Nativity of the Virgin, in Piazza Santissima Annunziata. It was probably the most important market-day of the year for the farmers as it was their last chance to earn money in preparation for the coming winter: In order to arrive early the inhabitants of the outlying regions would set off long before dawn and carry lanterns, made by suspending candles within tissue-paper wind-shades, to light their way. Entire families would come, dressed in their Sunday best, but they were ignorant country folk and their attempts at elegance only made the city people laugh in fact Florentines still call an overdressed, over made-up woman a rificolona. Children would blow whistles at them, and make their own lanterns with colored tissue paper to follow along, or shoot at the farmers' lanterns with blowguns, in an attempt to knock over the candles and set the tissue paper ablaze. The market still exists today in the form of a huge fair in Piazza Santissima Annunziata on the 6th and 7th September; it was the first fair held by organic producers in Italy, and remains one of the most important, with wonderful foods and performers of all kinds. Florentine children still get out their lanterns in the beginning of September and there are parties in the squares, with street theater and music. The Festa della Rificolona closes with a procession on the night of the 7th, from Piazza Santa Croce to Piazza Santissima Annunziata, which is led by the Cardinal; he addresses the crowd, then there's a final party in the streets until the early hours of the morning.